Figure 1: The partially completed Wallace. 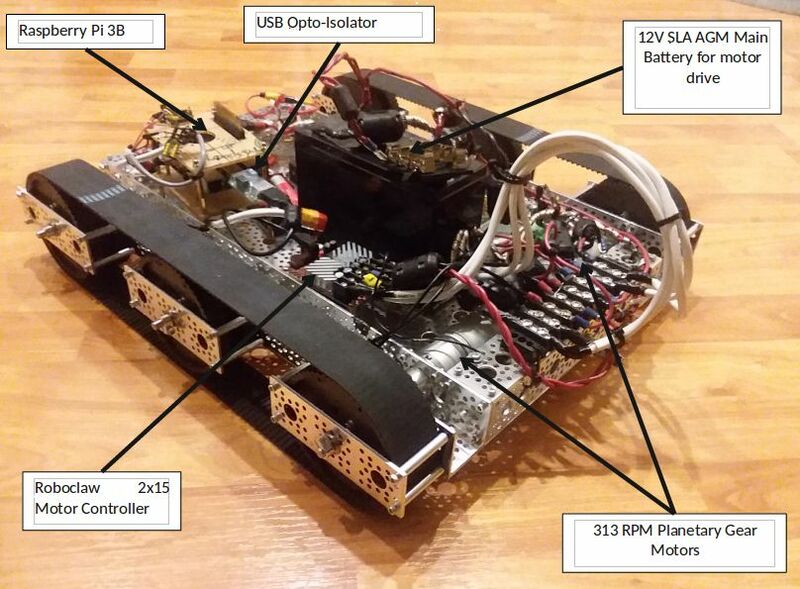 User elicorrales on Instructables has detailed a project to create an autonomous voice controlled robot named Wallace. Wallace is built from an Actobotics Agent 390 chassis and weighs in at 17 pounds. A pair of 313 RPM planetary gearmotors drive the twin tracks of the robot. The motors are in turn controlled by a BasicMicro 2x15A RoboClaw motor controller. Commands for the motor controller are fed to the RoboClaw by a Raspberry Pi 3. The Raspberry Pi is also used to process sensor data and provide an SSH server for controlling the rover. Power for the motors comes from a 12V sealed lead acid battery. 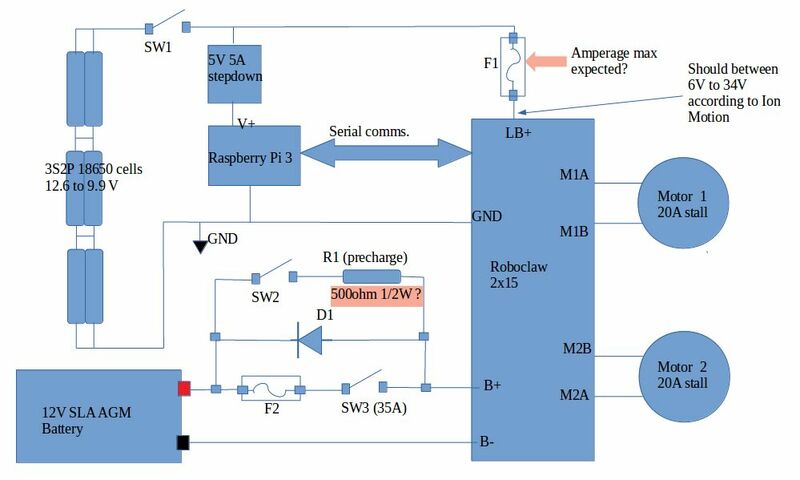 The Raspberry Pi and the logic power for the RoboClaw are fed from groups of 18650 Li-ion battery packs. A 5V switching regulator is used along with the 18650 cells to provide power to the Raspberry Pi. Fuses are used throughout the power wiring as a safety check. Further safety systems for the RoboClaw are provided in the way of a pre-charge resistor to limit insrush current to the controller as well as a bypass diode across the power switch to allow regenerative voltage from the controller to flow back to the battery. Motor noise suppression is accounted for by capacitors across the motor terminals and ferrite beads placed on the motor's power wires close to the motor. We thank elicorrales for documenting the build so throughly and for providing an excellent example of using proper safety systems to protect the RoboClaw and other hardware from damage. The full details of the build can be seen on Instructables at this link. Figure 2: A diagram of the power wiring for Wallace.